Learn more about MSM's policies for scheduling and practice. The Scheduling Office is located on the 4th floor of the Main Building in Room 407. The office is open 9AM-5PM, Monday-Friday. 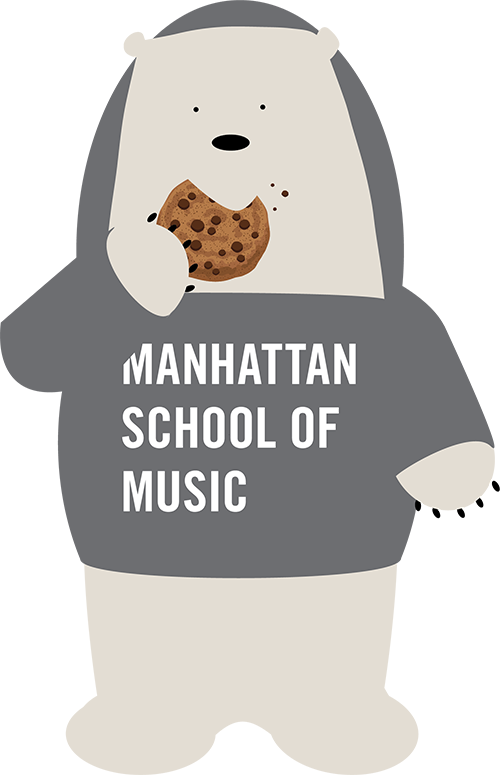 Manhattan School of Music provides practice space to registered students in good standing. This policy provides the most equitable use of practice rooms within the constraints of the School’s facilities. Any student violating these policies is subject to disciplinary action. The Scheduling Office may cancel or move bookings in case of emergencies. Practice rooms can be booked online 1 day in advance, beginning at midnight for the following day. Each student is allowed to book up to 2 hours of practice at a time (3 hours for Pianists) either online or in the Scheduling Office. Following the initial 2 hours booked (3 for Pianists), students are allowed to book an additional 2 hours (3 for Pianists) on the day of for practice either online or in the Scheduling Office — for a total of 4 hours per day or 6 hours per day for Pianists. Students are also allowed to book a total of 4 hours of chamber rehearsals for MSM chamber groups — students can book 2 hours of weekly time using the Chamber Rehearsal Application as well as an additional 2 hours 1 week in advance in the Scheduling Office. Practice rooms on the 3rd, 4th, and 5th floor of the Main Building, the 2nd floor of Andersen Hall, and the Andersen Hall Cellar can all be booked online here. Piano Priority Rooms can only be booked online by Pianists. However, non-Pianists may reserve these rooms on the day of if space is available. All rooms are first come, first served 7AM-9AM Sunday-Friday. Andersen 2nd floor and Cellar Rooms may be booked 9AM-10:30PM, Sunday-Friday and 6PM-10:30PM Saturdays. Andersen 2nd floor and Cellar Rooms are first come, first served for Andersen residents ONLY from 10:30PM-9AM Sunday to Friday morning and 10:30PM-6PM from Friday evening to Saturday. Practice rooms on residential floors are first come, first served for residents only. Rooms Include: Bass Hallway, CPP Studio, Dance Studios (priority for Musical Theatre Majors only), Harp Studio, Tuba Studio, Organ Studio, Harpsichord Rooms, Percussion Rooms, Jazz Rooms, and Electronic Music Studios. These rooms may only be used by students in the corresponding major, or if a student is enrolled in a class for that instrument. Students are allowed to use rooms (except Dance Studios, Jazz, Organ, and Harpsichord rooms) to store personal equipment; however, MSM is not responsible for any lost or stolen belongings left in these rooms. All general room usage policies also apply to priority practice rooms and studios. Bass Hallway, Harp, Tuba, CPP, Electronic Music Studios, and Percussion Practice Rooms are NOT booked by the Scheduling Office. Please speak with your department chair, major teacher, and colleagues regarding usage and scheduling of these rooms Sunday through Friday. Saturday requests for tuba and percussion students wishing to access the tuba studio and percussion practice rooms may email their request to precollege@msmnyc.edu to be added to the expected guest list. Students designated by faculty member Richard Sussman are allowed to access the Electronic Music Studios on Saturdays by signing in at the main security desk. Students should know that their right to these rooms is not absolute — if their practice interferes with the normal operation of Precollege activities they be asked to leave and/or come back at a different time. Practice on Precollege Audition Saturdays may be limited and/or unavailable depending on the needs and activities of Precollege auditions. Organ Studio and Harpsichord Rooms are booked by the Scheduling office. Organ majors may book recurring weekly reservations in the Organ Studio. All students in an Organ class may book these rooms one week in advance. Jazz majors are allowed to book Jazz Jam Rooms up to one week in advance. These rooms may be booked online or in the Scheduling Office. Dance Studios may be booked by Musical Theater students up to one week in advance. These rooms may be booked online or in the Scheduling Office. Bass, CPP, Harp, Organ, and Tuba Majors are allowed to check out a key for their Studio. These keys are to be returned at the end of each semester. All other students with a reservation in a Priority Practice Room or Studio may check out a key from the Scheduling Office or Main Security Desk. The failure to return any key may result in suspension of booking privileges and/or other sanctions as set by the Scheduling Office. Food and Drink are not allowed in practice rooms with the exception of water in a closed container. Students are not allowed to teach private lessons in any rooms at MSM. Students are not allowed to book rooms for the express purpose of recording. If a student wishes to book a recording session at MSM, please visit the Recording Arts Office in Room 312. If a room is not in use, any student may use the room. If a student with a reservation arrives, the first student must vacate the room. School officials reserve the right to enter a practice room at any time to monitor appropriate use of space and student compliance with all policies outlined here. MSM is not responsible for any items left or lost in rooms. Please refer to MSM’s Piano Policy here for additional policies on Pianos at MSM.